When you’re away from the kelp line and out into open water, surface action is so often the name of the game. Casting to following birds or boiling fish requires a braid that can reach the frenzy. This is when the smooth profile of an 8-carrier braid shows what it can do. Sliding effortlessly through line guides, Tuf Line Domin8 blasts from the rod and keeps on soaring. It returns to the reel just as silently as it lets out. Tie into the following review for all the woven details. Product: Tuf Line Domin8 Braided Fishing Line. Overall Ranking: 93 out of 100. For any angler wondering about the difference between 8-carrier and 4-carrier braids, Tuf Line has an explanation. It’s not a matter of one line being stronger than the other, though they each have their own limitations. The two braids have different weaves and those patterns have a unique profile. Using the contoured weave of Tuf Line 4orce 4-carrier braid helps cut through reeds and kelp. It doesn’t, however, have the smooth far distance castability of Domin8. One of the differences anglers find in 4-carrier braids like 4orce is they have a thinner diameter. Domin8 will give you extra casting distance and a quiet braid, but you won’t carry quite as much on your reel. Like most braids, Tuf Line breaks above its test rating and they provide these stats. See the list below for those details along with diameters and monofilament comparisons of Domin8 braid. Tuf Line manufactures Domin8 braid using new technology in PE fiber that they call Tuf-X. Domin8 comes out thinner, stronger, and with a smoother profile than other like brands. Though there isn’t much info about Tuf-X, it likely follows along the same lines of the Daiwa J Braid Grand. Look for a future update as more info on Tuf-X arrives. Tuf-X fiber in an 8-carrier weave serves to create one of the smoothest braids on the market. Each carrier contains a spool of Tuf-X and the braiding machine weaves them around a solid filament line. Four carrier braids such as Tuf Line 4orce have a rougher profile and work better to cut through vegetation. Braids like Domin8 don’t perform as well cutting through cover but they make up for it when casting. After finishing the weave of the Domin8 braid, Tuf Line applies a proprietary coating that bonds to the Tuf-X fibers. The resin-like clear coat slicks out the already smooth line, reducing friction to an even greater extent. It gives the otherwise pliable braid some sense of memory which makes it easier to handle. Last but not least, the coating protects the braid and adds life as a result. 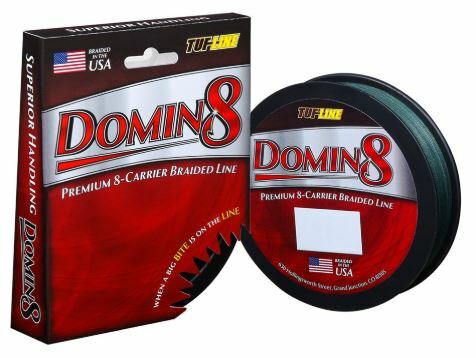 Domin8 is a specialty Tuf Line braid with the full intention of increasing your casting distance. Its 8-strand weave presents a smooth braid and the final coating gives it a glossy feel. In combination, these qualities provide the angler with exactly what they set out to do. Help the jig angler reach the action at distances that seem unattainable. A bi-product of smoothing and slicking out Domin8 braid is a quiet working line. 4-carrier braids have a tendency to make noise off the rod due to the more contoured profile. An application of resin coating helps 4-carrier braids like 4orce, but won’t be as silent as Tuf Line Domin8. On both the cast and the retrieve, Domin8 operates without making a noise. 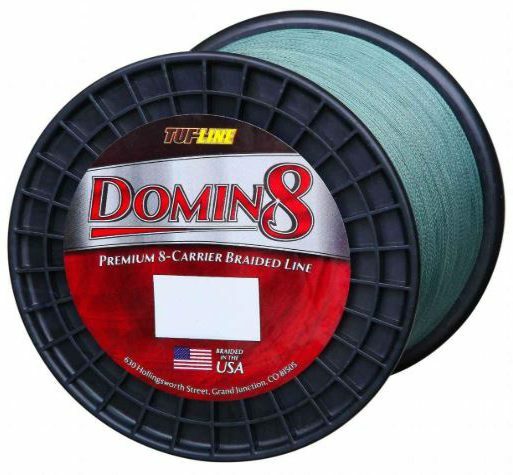 Fishermen often choose Tuf Line because it lasts longer than other brands, and that holds true with Domin8 braided line. Having an 8-strand weave makes it smoother and less apt to fray. Don’t discount the resin coating which adds that final element of protection. Coating the fibers keeps them from direct contact with line guides and it locks the color in. Domin8 braid works best for primarily casting anglers. If you carry your jig stick on every trip, Tuf Line Domin8 makes a fine choice for that setup. When fish come to the surface, they often do it in a frenzy that doesn’t last long. Anglers need to react fast and that extra bit of distance can mean a hook set or without it, an empty retrieve. As a specialty braid, Domin8 hinders the ability to cut through reeds or kelp. If you’re fishing around cover, 4-strand braids like Tuf Line 4orce are designed to perform the job. The other main disadvantage of most specialty braids is that they don’t come cheap. You’re much better of going with a quality standard braid like Tuf Line XP or Power Pro Spectra if you don’t have such specific needs. Domin8 braid has the same qualities you’ll find in all well-built braided fishing lines. You’ll feel every strike on the end of your rod due to its sensitivity and non-elastic nature. Braided lines such as Domin8 are also thinner than monofilament or fluorocarbon. Anglers can wrap many extra yards on their reel in comparison to other types of fishing line. Casting distance, of course, is the main benefit of Tuf Line Domin8 and it calls out for the lure. Customers can find answers to questions or ask their own via the email portal on the Tuf Line website. You’ll find their direct address as well as a phone number to call during regular business hours. Discover how to knot tying videos, testimonies from the Tuf Line Pro Staff, or check out their Wall of Fame. Anglers send in pics of their catches while using Tuf Line products. Consider the rating for Tuf Line Domin8 a number in comparison to other specialty 8-carrier braids. It surely won’t land in your 90 plus percentile if you’re not in the market for a casting braid. If you are a jig casting iron throwing angler, however, then Domin8 braid falls right in your radar. For its smooth casting ability, Domin8 braid has a value well-worth some extra dough. Use that comment section below and tell other anglers about your personal experience with Tuf Line Domin8. Don’t think twice if you have any questions as FishtFight will do our best to get an answer. Thanks for consuming the info and tight lines til next time.